← Bolivia already experiences turbulence in the economy led by the ruling ochlocracy! Inside Bolivia’s long struggle to unlock the world’s largest lithium supply, thanks to ruling ineptitude! At the heart of South America, the long-struggling nation of Bolivia sits atop an unlikely gold mine: the world’s largest lithium reserves. It’s been nearly a decade since the Bolivian government first set out to capitalize on this precious natural resource. Yet while the booming tech industry has recently sent lithium prices soaring, Bolivia appears to have made little progress toward meeting this growing global demand. But like the salt flats that cover Bolivia’s deep ocean of lithium and other minerals, there’s more to the country’s lithium industry than meets the eye. For the impoverished, landlocked nation whose natural resources have historically been pillaged by foreign powers, the struggle to independently profit from its vast lithium supply is symbolic of a larger national effort to fully emerge from beneath the shadow of its imperialist past. In an attempt to propel the slow-growing lithium industry forward, earlier this year the Bolivian government proposed a plan to create a brand-new, state-run lithium mining corporation. The latest endeavor, billed as a sustainable move toward monetizing the country’s bountiful lithium reserves, is just the latest in a series of similar initiatives the government has pursued over the years. It may also be an effort to turn both the national and international spotlight back onto the efforts of President Evo Morales — a longtime champion of the country’s lithium project — ahead of his upcoming bid for reelection in 2019. Repairing Bolivians’ historically fraught relationship with their country’s natural resources was a key tenet of Morales’ historic 2005 campaign to become Bolivia’s first indigenous president, and within his first hundred days in office he’d nationalized the country’s oil and gas industries. In 2009, Morales enacted a new Constitution — approved by national referendum — that expanded the rights of Bolivia’s historically oppressed indigenous majority, further enabling him to follow through on his promise to redistribute export profits into the pockets of the people. Under Morales, a global commodities boom helped drive economic growth in Bolivia by an annual average of 5 percent. By the time Morales secured his third consecutive termin office in 2014 (despite having just imposed a two-term limit for presidents in his new Constitution five years prior), half a million Bolivians had managed to rise above the poverty line. Despite these strides, Bolivia remains one of the poorest countries in South America. 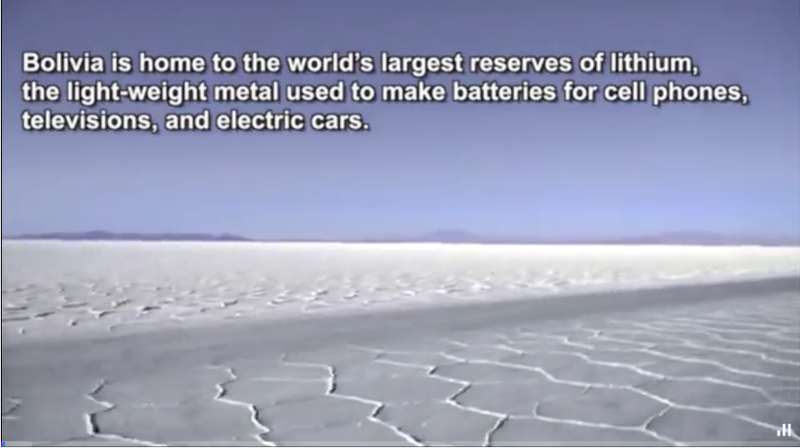 And the lithium project has yet to meet most of the lofty goals laid out by Morales when he first unveiled his plan in 2009 to transform Bolivia into a sort of socialist hybrid between Saudi Arabia and Detroit. Beyond retaining Bolivian control of the extraction process, Morales sought to create an entirely new national industry, promising to make the long-suffering landlocked nation into a leading global source for not only lithium, but Bolivian-made batteries and even electric cars. Eight years later, Bolivia’s lithium industry consists of a single pilot plant, which finally shipped its first order of lithium carbonate to China this past September. A little more than one year before that first big sale to China, a visit to the Llipi Loma Pilot Plant provided crucial insight into the roots of Bolivia’s fledgling lithium industry, and the obstacles to making Morales’ vision a reality — starting with the setting. The Llipi Loma plant sits at the edge of the world’s largest salt flat, a blindingly white expanse that looks more like the surface of a lifeless planet — or the set of a post-apocalyptic movie — than any earthly landscape. “Here, there was no electricity, there was no water,” Marcelo Castro Romero, the plant’s then head of operations, said two summers ago, looking over the blank expanse. Beyond providing guided tours in the rare instances that journalists are allowed to visit the plant, Castro (who reportedly stepped down from his post this past September) appeared at the time intent on conveying the circumstances into which the facility and the entire lithium project had been born in an effort to explain its apparent state of paralysis. Writer of this article fails to acknowledge the real nature and capacity of current president: this coca grower caudillo has had absolute control of ALL State powers and managed to waste over $160 billion dollars over the last eleven years! A true populist demagogue with old-development-ideas from mid 20th century has managed to provide NO legal certainty to local and international investors. China came with billions in loans, provided Bolivia uses Chinese companies and labor force, a total scam! Not a single sustainable job was created nor significant and real foreign investment was secured. This delusional egomaniac lied Bolivian population with the lithium industry, to date the company that the above article mention has declared to be going bankrupt, lots of money was wasted to “assemble” those lithium batteries with an old technology which is useless for current devices that require such energy. The world must understand that this regime bragged about bein mother nature’s protector as well as indigenous champion. His wrongdoings, violence to indigenous people at Chaparina, the booming narcotrafficking that uses the coca leaf produced by his constituents have generated anarchy and violence never experienced before. In sum, this is worst ochlocracy that ever assumed power in Bolivia! This entry was posted in Bolivia, Business, Economics, Energy, Environment, Politics, Potosi, Social Unrest and tagged bad business, bad politics, corruption in public office, government failures. Bookmark the permalink.